this bike! 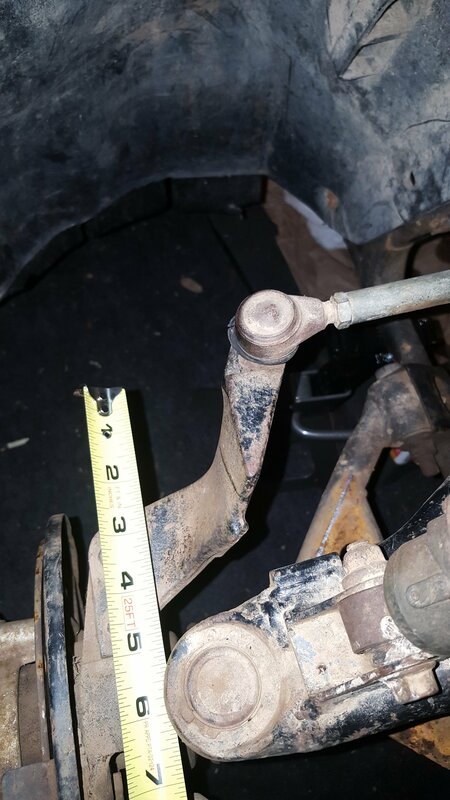 did this guy sucker me or what.. ok, looks like this means something is bent that I do not see or one rod is longer vs the other? perhaps this is not the rod, looks like the piece it connects to. I need to pull the wheel. this thing is missing pins and such heh well, look at all my improvements I'll have in no time! 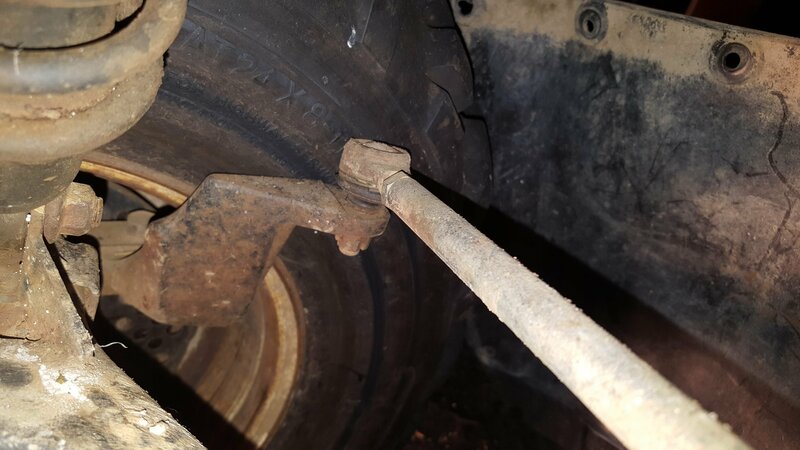 That part you think is bent is not really likely to bent. It’s more likely to snap or break i should say since it’s a casted metal piece. 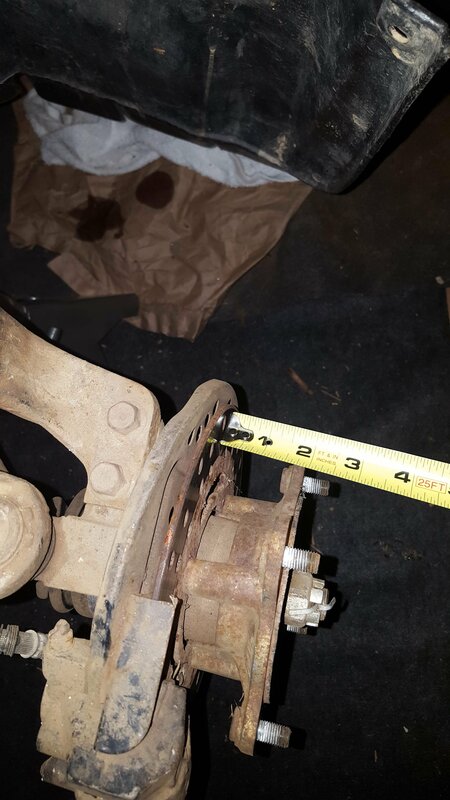 I would def pull the wheel to see if something is missing like a spacer or a blown/collapsed bearing or the wrong rim maybe? yea some folks are like that... just out to scam people.. I got screwed on the bayou 300 I bought too. I'm hoping wrong rim. 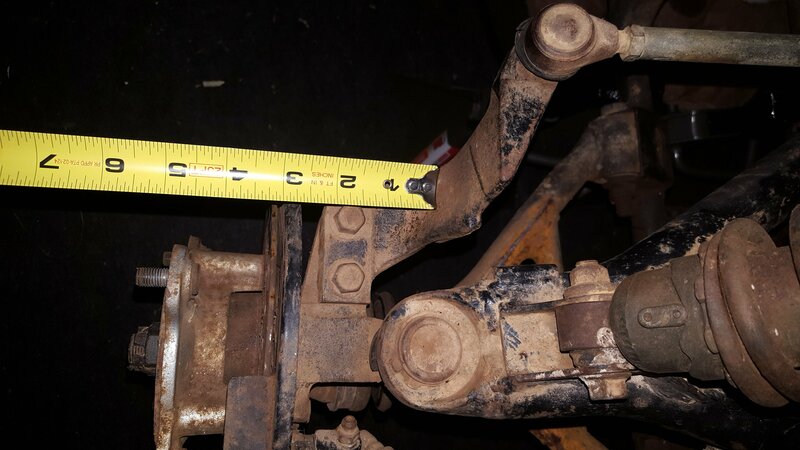 You are right, that steering knuckle is thick metal and lined by 2 bolts, I do not think that can be adjusted. Must be wrong rims or tires (probably both). Does there look like any welding was done on any of the parts ? You are going to have to turn the wheel in both directions. And while doing so take a few seconds and try to wiggle the parts on that front end for movement. Also look behind the rotor and compare one rotor to the other sidde. Also clearance between the back plate. Compare both sides take some pics and post. Maybe we will see something that stands out. Ok so take some measurements and see what’s didfent. Feel around a bit see what’s wrong. You will find it. 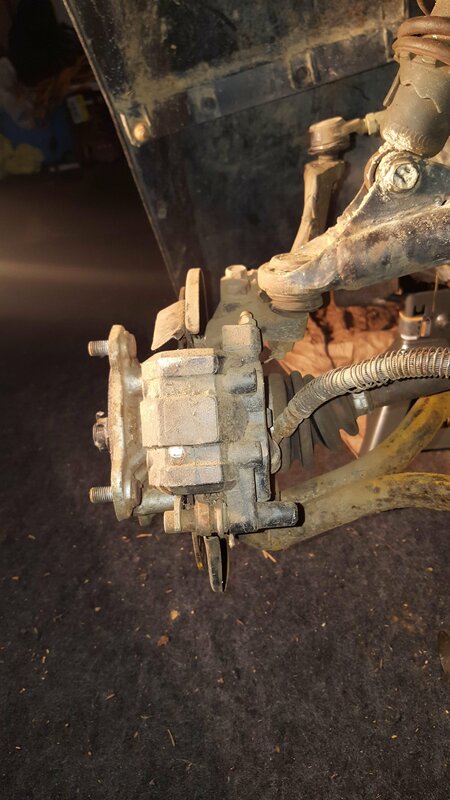 yes perhaps it is not the color/nut there, but the compression of the hub. 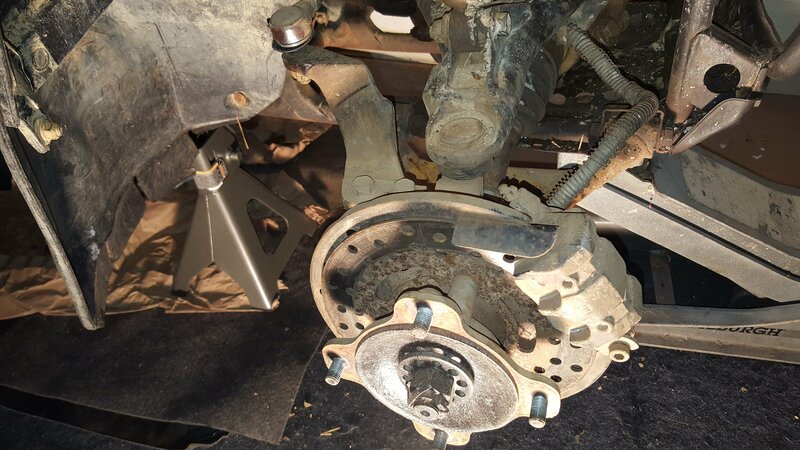 I recall doing something like this with brakes/calipers. I measured and left side appears to be compressed in a bit more.. might take photos and upload to confirm what I am seeing. 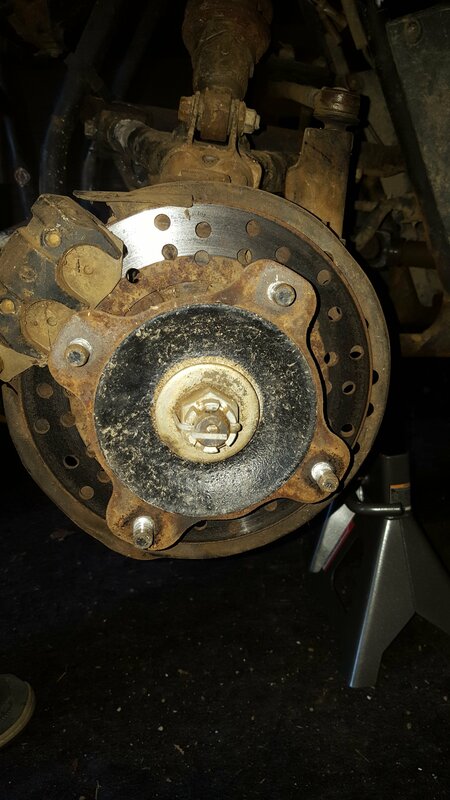 Yep maybe a collapsed bearing. 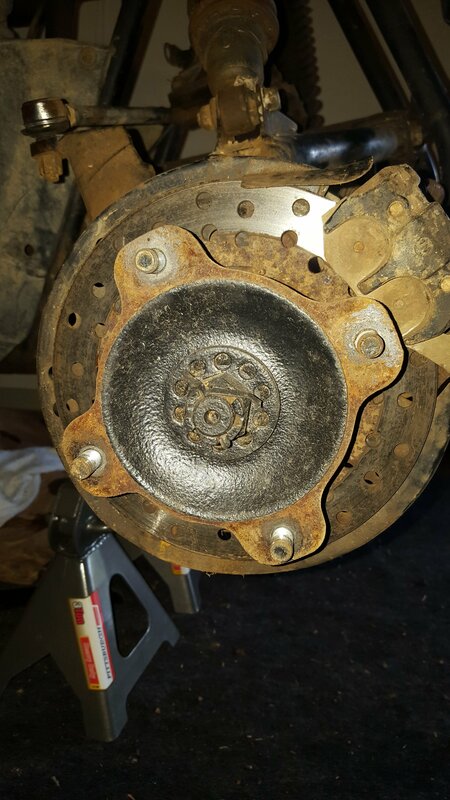 Only thing that gets me is the rotor would have some play in and out. 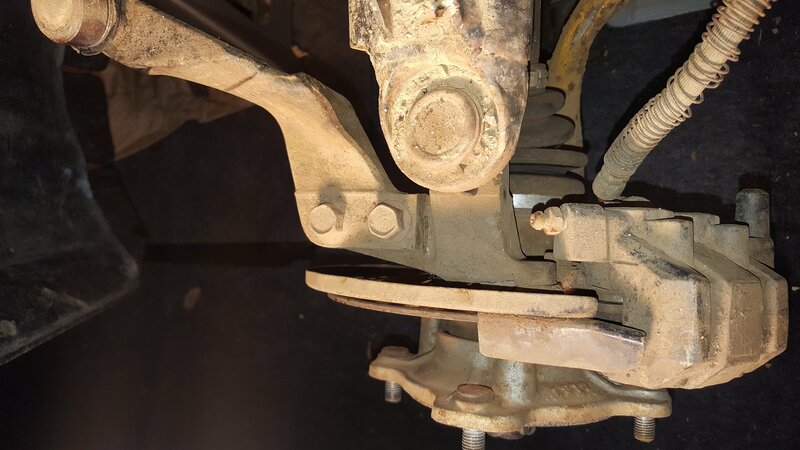 this steering knuckle is not the same as the other. I would think they should be same height. The right is about 1/4" or so taller and further back. So most likely it was wrecked and another year knuckle was put on you think ? You can’t do a larger front wheel. 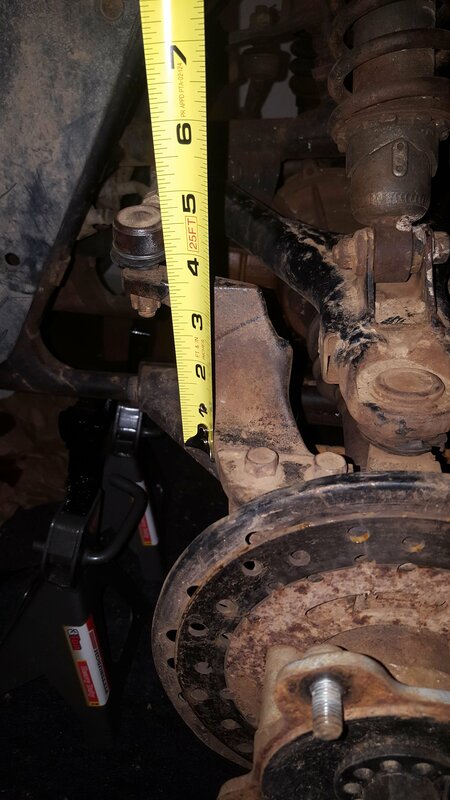 They all have to be the same size or you will destroy the transmission. well now I'm confused. ebay shows me left/right knuckles and they appear to be different shapes/sizes. I can not see it on partzilla/others (yet). still searching. and yea wrecked/salvaged bike I'm thinking.. with the damage being mostly on that side (it seems) and maybe he did not know the year and bought 95 and it's 93? (I'm assuming it as well). although I thought those years almost everything was identical for the bayou 300 4x4. Unless it was a 400 Bayou part that was put on? Any other damage that you can see on the frame ? in terms of damage. there is damage in various places. I would think the right side has something but I have not spotted a bend in the actual frame on that front/right side. however, if there is - it should be helping in this situation? or not at all. 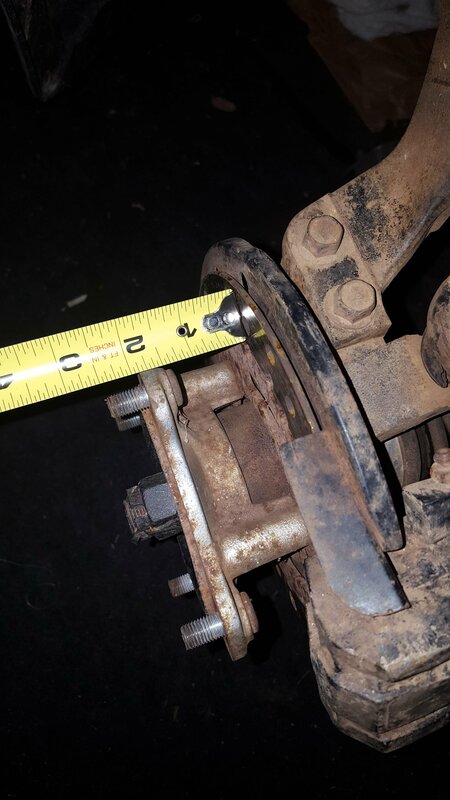 I have to figure out the wheel size or try my luck with other parts as I can not seem to order just the knuckle and gl with size specs from ebay parts. here's some more photos if you see anything. my best guess is I bought a salvaged unit. the guy chopped the vin and welded in where it used to be (or maybe the person before, who knows). they guy I got from claims he bought off auction and flips toys. this stated as to give some perspective to my struggle in finding details that can help us. there's no snow on my yard, I am bummed. I can not sticker this and take to a trail and play (legally anyway) where there is snow. either I buy one that I can register and get a "green sticker" .. or I buy a frame and swap everything. I really feel like doing so as then I have zero question as to what I am working with. assuming the engine can mount into a range of years, which, I would get a 1994 frame based on my research and parts available. I read it takes a pro shop about 1.5 days to complete the job of swapping frames (bent frame and minor bolt on part damage also replaced). front and rear look pretty easy.. the center is where I fear I'll get lost in weeks of trouble. Quick question. 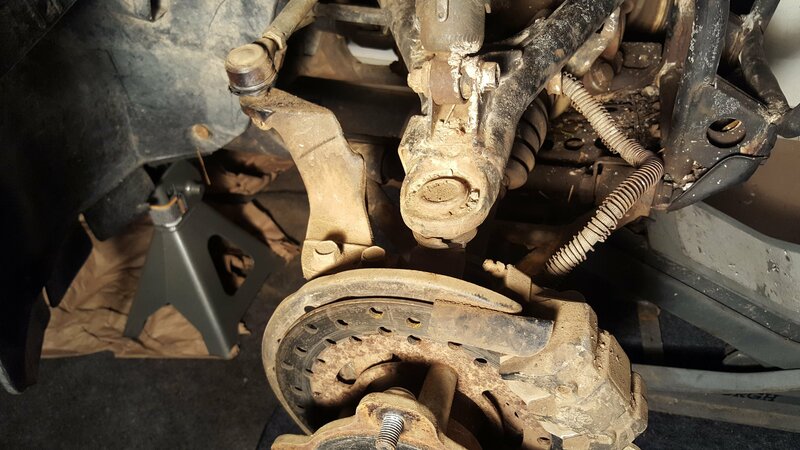 Have you put the wheel back on whole or in the air and see if the rim or axle is bent ? if so, very little and it would have to be on both wheels the same I think as I tried the other tire (left) and same result. seems unlikely both wheels would have same bends , right? however ... axle. hmm how do I test (I'll have to start searching). Rims not likely both bent but you never know if that thing was slammed down on the front wheels. Is the wheel marked all the way around on the inside ? 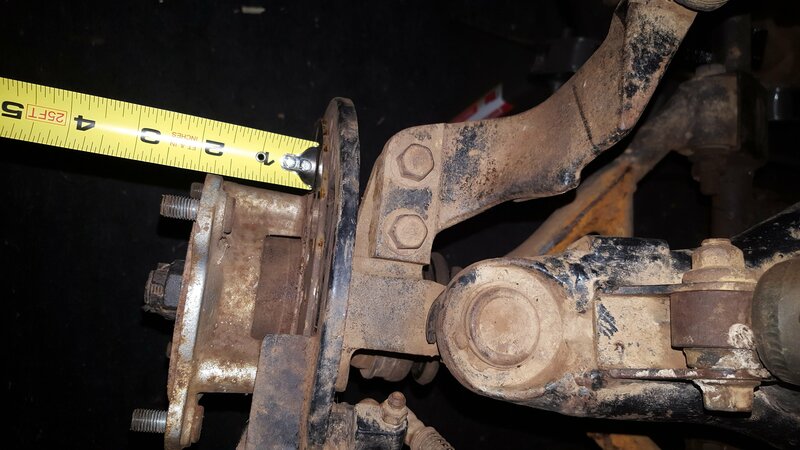 That would be a good indicator if the axle is bent or if it’s a constant rub then it would be more likely a wrong part or bearing issue axle in to far etc. while messing with it, it does appear that only 1 side might be off/bent. 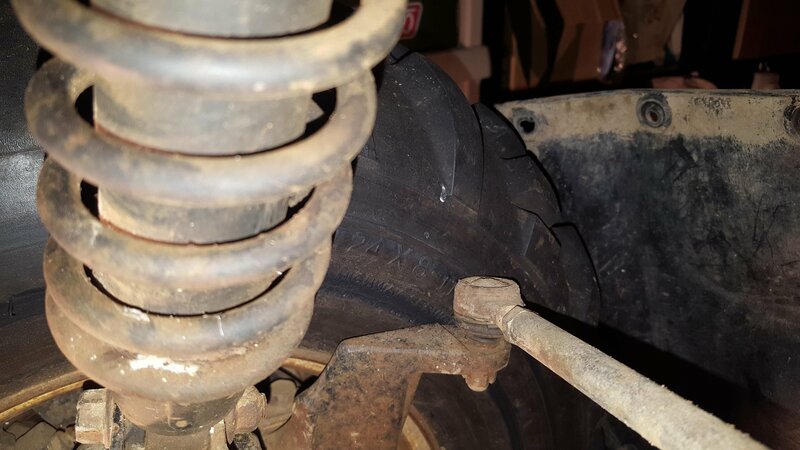 I could get clearance with 3 of the lugs semi tight, the 4th I had to leave loose.. hope to soon nail this root cause! Put a few washers on to give you some clearance for now until you figure this out. mean time you may find a new assembly on ebay depends on how much more you want to go for on this bike. I'm not planning to flip bikes unless I have some hidden talent that surfaces once I get deep into the metal, and so far, no hammers have lit up or sang to me so .. I have day dreams to re-frame it, do a full amazing rebuild. saving money on parts that work , etc etc. I could also see me building this out pretty (make it look like you did it!!) and buy another that is ready to go. I'm not buying another unless it's 95% running and clean or ~$500 and have fun fixing. Quick question I want to dumb this down a bit. 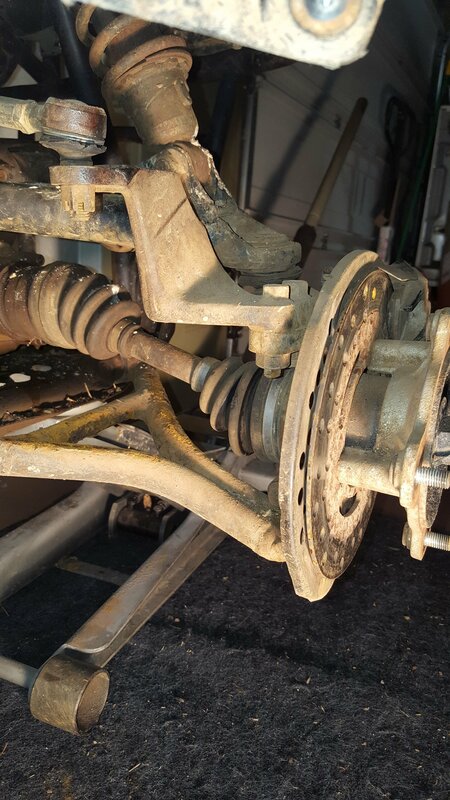 Are you sure it’s not just a tie rod thats bad ? 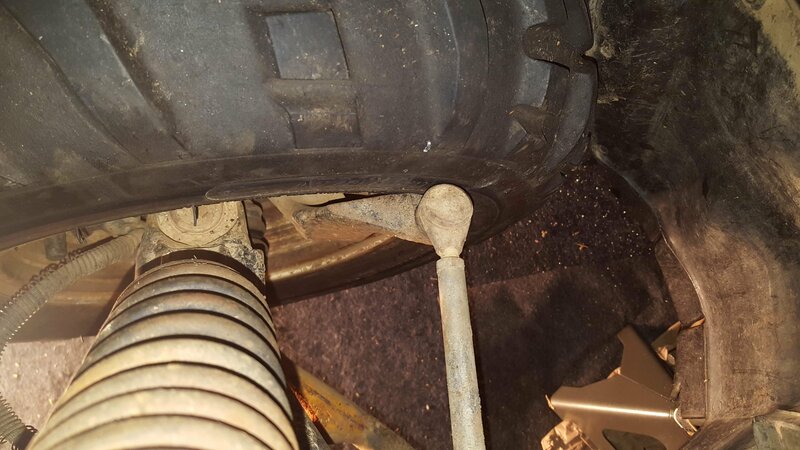 Is the tire just hitting the tie rod ball or the knuckle as well ?